Tweet at your members of Congress and tell them to stay strong against Trump's border wall. Thousands of federal and contract workers like Lila don't have the income to pay their bills and put food on the table due to the shutdown. And the truth is, Trump and Senate Republicans can put an end to the government shutdown immediately by voting yes on the bipartisan bills already passed by the House. Sign our petition to demand Trump and McConnell re-open the government so workers like Lila Johnson can pay rent. 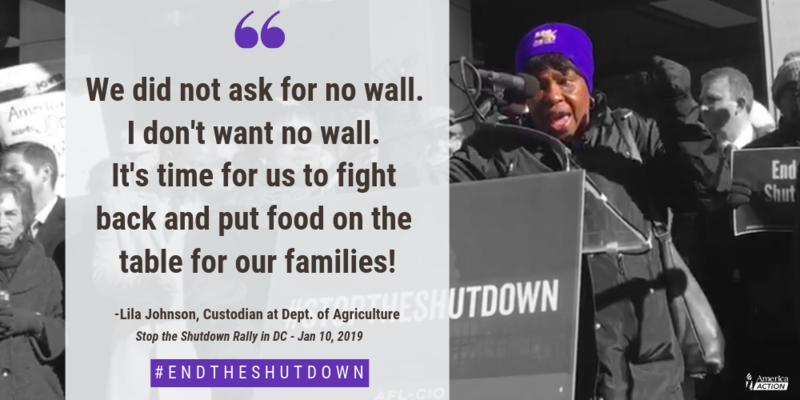 If you're following us on Twitter, you've already met many workers who are struggling because of the Trump shutdown. Workers like Faye Smith, Lila Johnson and Angela Vasquez who bravely shared how the shutdown is causing pain for them and their families. Whether you've directly been furloughed or caught in the ripple affect of the Trump shutdown, we want to hear from you. Trump, McConnell and Senate Republicans are holding hundreds of thousands of federal workers' paychecks hostage. For many who live paycheck-to-paycheck, that means not being able to pay for their rent, bills and put food on the table. Some are on the verge of being evicted. If you would like to make a donation to these workers, visit Community Services Agency at www.communityservicesagency.org and click the 'Donate Now' button. For questions, call Sonté DuCote at 202-974-8226 or sducote@dclabor.org.